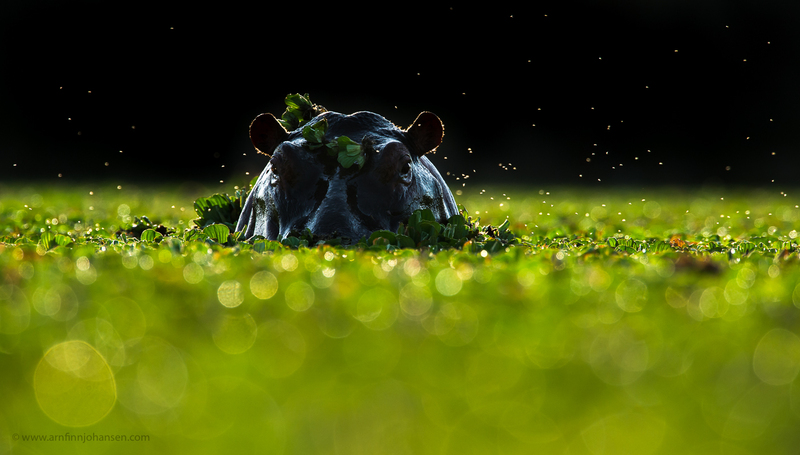 Selected from 16,500 images, it is a pleasure to let you know that my low angle backlight image of a hippo bull has been Highly Commended in the Mammals category in GDT European Wildlife Photographer of the Year 2013. The same image was also Highly Commended in this year´s Asferico International Nature Photography Competition, so truly this hippo bull has given me good luck! Congratulations also to other Norwegian photographers winning prizes in GDT 2013, hereby Audun Rikardsen (Highly Commended in Birds Category), Erlend Haarberg (Highly Commended in Mammals category), Lars Andreas Dybvik (1st place in Nature´s Studio category) and Pål Hermansen (Fritz Pölking Prize 2013). No doubt Norwegian photographers are doing very well in reputable international nature photography contests. GDT is an international nature photography contest for professionals and amateurs worldwide. This year photographers from 32 countries – in all 16,500 images – entered the competition. The winning ceremony took place 25th – 27th of October at the International Nature Photography Festival in Lünen on the outskirts of Dortmund, Germany. The winning images will be displayed in the GDT 2013 Yearbook availible for purchase from GDT´s website, and after the festival the winning images also will be displayed in GDT exhibitions including the Museum of Man and Nature (Museum Mensch und Natur) in Munich will showcase the photographs of the competition presenting them in a large special exhibition opening November 28, 2013. The small pond was completely covered with a green carpet of floating water hyacinths, and just as the hippo after a dive shows up from the water a swarm of insects took to the air. Laying on my elbows on the muddy shore with my camera gear and myself solid planted in an undefined mixture of water, soil and hippo poo, I had a great superlow angle from where to photograph this hippo bull in backlight in the early sunrise of Maasai Mara. Thanks to Big John, our Maasai guide guarding from the Landrover behind for other hippos coming back to the pool. Also thanks to Ole Jørgen Liodden and WildPhoto Travel for a great trip and company. Please click on the image to enlarge and see it in 1400px quality. Hippo bull with surrounding insects. Maasai Mara, Kenya. Highly Commended photograph in GDT European Wildlife Photographer of the Year 2013.
generally hipos are not the most attractive animal you would want to see but this image has certainly proved it wrong .. the best hippo image i have seen , congratulations arnfin. Velfortjent! Et bilde ladet med spenning. Røft utsnitt og kontrast understreker øyeblikket. Gratulerer! Gratulerer! Et storarted bilde, Arnfinn! kuleste flodhestbildet jeg har sett i hvert fall – du har både blikket og evnene – suverent Arnfinn! I convinced of the fact that you shot it like this and didn\’t apply any changes in Photoshop. I know you can get very nice effects by shooting against the light. Very well done ! Keep up the good work Arnfinn ! Wonderfull shot; \”circle\” aroud the hippo is very beautiful (it seems to be a circle:)) and picture is very strong.I´m following Your work and can get a lot for my hobby. Thank You! Greeting´s from Tuula, too! Gratulerer! Bra bilde! Vra selv ved den samme dammen i sommer. Regner med du krøp helt ned i skråningen med fare for å ramle ut for å få dette blinkskuddet? Tror plantene er Pistia sp. og ikke vannhyasinter? Hei Alf Jacob. Bildet er tatt fra den siden av hippodammen hvor det er langgrunt. Kameraet og 600mm er plantet helt ned i gjørma/vannet, og det samme er fotografen… Den mørke bakgrunnen i bildet er skråningen som ligger i skyggen når sola akkurat kommer opp over horisonten (motlys hvor sola kommer opp såvidt litt til venstre bak flodhesten). Jeg trodde det var vannhyasinter, men det er godt mulig det er Pistia sp. Congrats on the award once again ! No need to say that this is another striking image. Shooting (more or less) against the light gives wonderful results and you can darken the background a lot ! Hi Johan. Thanks a lot for your nice comment! For your information the background is not darken by me in Lightroom or Photoshop. The dark background is natural due to a relatively low but steep slope surrounding that side of the pond. Because of the low angle of the rising sun, coming from behind, this slope is in the shadow. Also images will not be approved by juries like the one in GDT if the photographer exaggerate in the editing of the photograph, ref raw file requirement in the finals.